Disney princess Aurora is a travelling expert. She loves to record her journey with her travelling blog and share more useful and fun tips with travelling lovers. This summer Aurora wants to go to Paris as her destination. Let's help her create a travelling blog to Paris in France and enjoy every moment of it. Day one is all for French food. What is French breakfast look like? You will find out! Day two is for sightseeing. What to wear in the city of romance and fashion? Aurora surely knows the best! Day three is for shopping! Aurora is ready to go shopping spree. 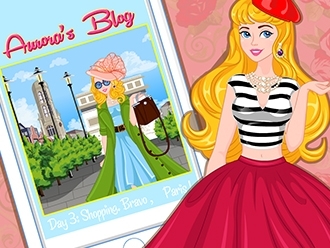 and she needs your help in picking up the most cute outfits for shopping day! Have fun!